Second of all, does anyone know whatever became of them after the Spanish Civil War was over? Did the survivors all return to the USSR? Or did any of them go on settle in other parts of the world, or perhaps to "volunteer" in other conflicts? Was it really that easy back then to simply leave the USSR to "volunteer" for causes in other countries? Hang on, what? The International Brigades are very well known and famous! There's a war memorial to the British Brigaders who died in Glasgow and another in London. Most Brigaders left in 1938 – La Pasionara gave a speech at their disbanding and march-past in Madrid – after the organisation was folded into the Spanish Foreign Legion (the Republican one; the Nationalists had the original one). The Soviet advisors and agents that went to Spain and returned had a very short shelf life, lots of them were purged by Stalin as they'd had contact with the outside world and groups like liberals, anarchists, socialists, etc. British, American, Canadian, Irish, French, German, etc Brigaders who stayed on in Spain ended up in France, mostly, and lots of them were still there when the Germans invaded (in interment camps courtesy of the French government, some of them). Some of THOSE, along with Republican Spaniards who'd fled to France, ended up in Organisation Todt as part of the 'Rote Spanien' unit (yes, Red as in commie!) doing logistical work for the Germans. Most survivors returned to their countries of origin and later fought in WW2 with one or other of the Allied powers' armed forces. As far as 'bringing their own tanks' goes, the Soviets shipped a lot of (very good) equipment to the Republicans, particularly I-15 and I-16 fighters, T-26 tanks, and BA-6 armoured cars, not to mention small arms and ammunition. However this aid came at a cost – it gave the Spanish Communists serious political leverage (leading to a civil war within the civil war, the crushing of the non-Communist radicals and liberals) and that in turn caused disarray and contributed greatly to the government's defeat. Oh, and they got Spain's gold reserves in payment. Soviet citizens who didn't return to the Union ended up in Europe, Latin America and America – but as far as I know, most, if not all, of the Soviets who came across with the arms shipments went back to the Union in 1938/39. Some of the Soviet officers and advisors did tours of duty, staying for a few months then rotating back; that wasn't the norm though as far as I can tell. 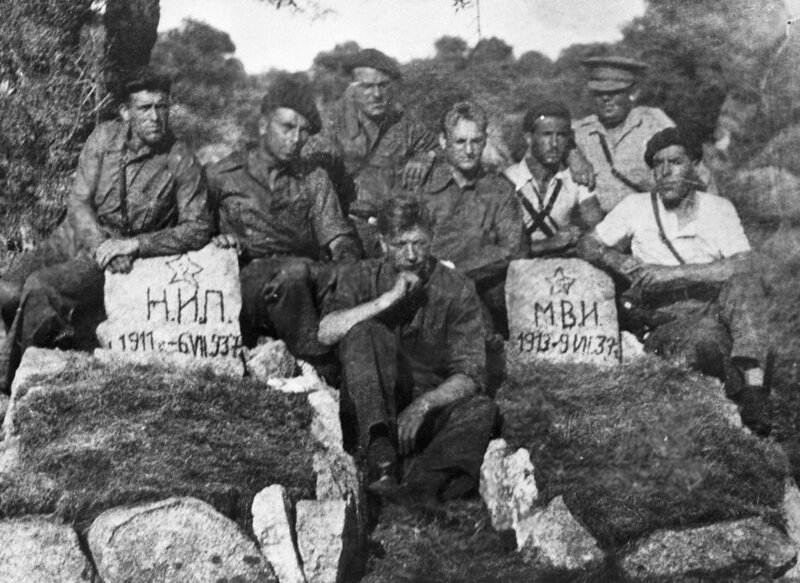 There's a lot of material here on Soviet military personnel and volunteers, fighting in Spain on Republican side – but in Russian, of course. Not sure what you'll receive after google translate, but I'm posting a few links here. Pdf is a small monography on the subject. The Soviet volunteers (and 'volunteers') fought as part of the IB and a few in the Republican Army. This contrasts with the Condor Legion and the Italian CTV; which although integrated into the rebel's command structure were discrete entities, fighting as whole units – and in the case of the CTV, taking on whole campaigns and operations by themselves. So there is an argument that the rebels were the only side to use foreign forces as discrete units; certainly both sides made extensive use of non-Spanish personnel, and you would be hard-pressed to find any history teacher talking about the SCW in the UK at least who'd argue otherwise. I was always aware of the IB. But I had no idea how many Soviets had shown up too. And if they were active military when they left the USSR for Spain, etc. They weren't simple private citizens that just went on an adventure to fight for a cause, like the other IB claim to be. The Soviets were obviously sent there. 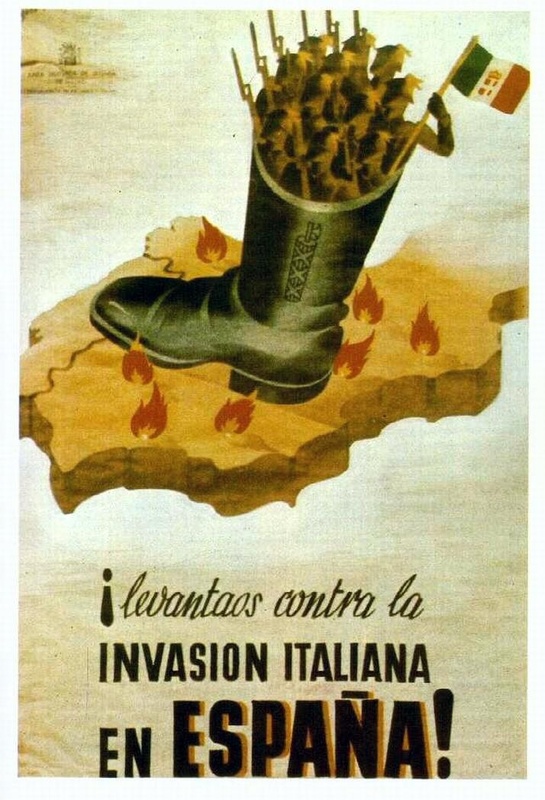 I just love all the Leftist period posters claiming that the fascists are letting the country be overrun by "foreigners" when both sides did it extensively. You've gotta admit that the "discrete entities" designation is just a technicality. PS. Here is some of that propaganda I mean. There were many others, of course. "The claw of the Italian invader seeks to enslave us!" Both sides in the SCW had foreigners serving in their ranks. On the Nationalist side there were discreet units of Moors, Portuguese (although most served in line Nationalist units), French, and Irish plus the German and Italian contingents. There were even a few Brits. On the Republicann side the International Brigades filled the place in the Popular Army formerly by the Legion Extranjero. They were recruited from almost every European nationality and eventually were grouped into battalions where there was a common language. Most Russian advisors either trained Spaniards how to use the weapons the Soviet Union was supplying or served in the front-line as commanders (IB), staff officers, or pilots. At one point there were whole squadrons in use that were flown by Russians, although as the war progressed their places were gradually taken by Spaniards. One area where Russian advisors were also active was in the Republic's police and security services, and NKVD officers effectively ran the SIM, the secret police. So what happened to the advisors who returned to Russia? It varied. Some were purged (usually those who had been higher up the ranks), some were sent into obscurity and/or the Gulags, and others carried on their normal lives. Several rose to prominence during the Great Patriotic War. Don't forget that some Spanish Republicans went to Russia when the war ended, and one – Enrique Lister – commanded Russian troops fighting against the Axis. Other Republicans served in French Army and fought against the Germans as members of Le Clerc's forces or in the Resistance. I am currently re-writing and expanding my 1993 book LA ULTIMA CRUZADA, and hope to publish it before Christmas. I can't wait to hear when it's finished. Please let us know where to grab a copy. PS. Of my Mom's older siblings, one sister was stuck in Asturias with relatives when the war broke out. Then 3 of her brothers went to Spain to look for her and got separated. After the war they found each other again and realized that 2 had joined the Republican forces and the other one fought with the Nacionalistas. Titi Fefin had some really horrific stories of her time in Asturias. I think she was in her early teens back then. Perhaps worth noting that there were some authentic Russian--not Soviet--volunteers in the International Brigades. They were surviving exiles from the Russian Civil War, promised a return home if they survived. Most, of course, went straight to the gulags. And there were a smattering of more ideologically consistent Whites volunteering for the Nationalists. Bob, remember the FFL recruited heavily out of those Republican refugee camps in the south of France, and they fought--everywhere. Some of the POWs from the French Indo-China War stayed on in North Vietnam, and when the last 20+ finally left in the early 1960's, they went home to Spain. I will be announcing the book's publication on my blog Wargaming Miscellany and hopefully on TMP. It will be published via Lulu.com, and should be available from Amazon and Barnes&Noble thereafter. Hang on, what? The International Brigades are very well known and famous! I believe the emphasis here is that, while the International Brigades may be well known in some areas the Soviet citizens who severed as volunteers are not generally recognized. Also I ought to say, in America at least, knowledge of the Spanish Civil War is extremely limited among most people. 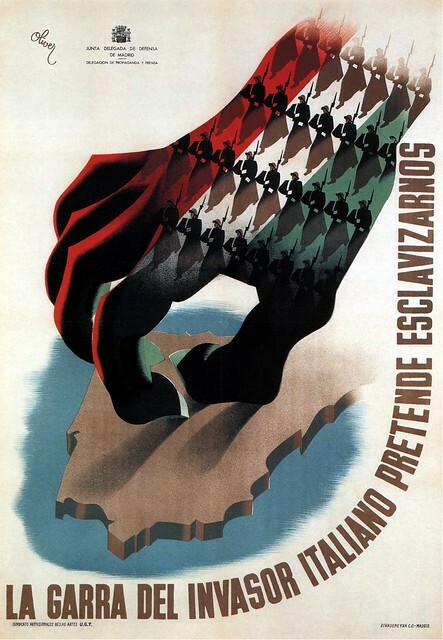 In reference to the propaganda-- it *is* propaganda, but it's worth noting that there were times when as many as 10,000 Germans or 50,000 Italians were in Spain as foreign forces, so you can see how it might be effective. Optional, are you saying there were actual Soviet volunteers, as opposed to Red Army (and NKVD) personnel Stalin sent? 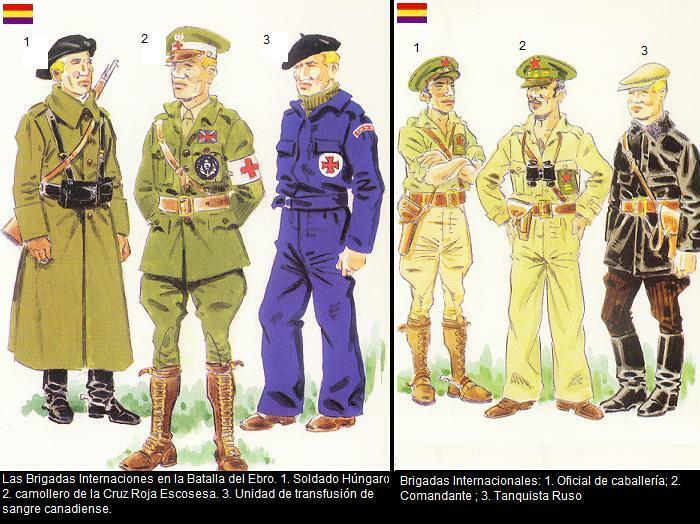 Because every Soviet I know of in Spain was "voluntold," as the Army puts it. Note that the Internationals, who really were volunteers, include approximately zero Russian-speaking units. Except for that smattering of Whites trying to go home--and they were certainly not "Soviet" citizens--all the Russian-speakers are attached Red Army and NKVD personnel--officers, trainers and commissars, no more volunteers than a Green Beret in Iraq. Somewhat less in fact: our people can get out of Special Operations without looking at ten years in a labor camp. I think equating international involvement between Soviet and German/Italian contributions is a bit misleading. The comparison is between small numbers of Soviet personnel acting primarily as 'military advisers', and entire divisions sent by the governments of Italy and Germany. The IB are another matter altogether, being individual volunteers. The other thing to note is that while Britain and France were officially neutral, unofficially, they did everything short of declaring war to support Franco, seizing privately funded arms shipments, blockading Spanish ports, freezing Spanish Government assets and so on. If you want a good single volume coverage, then Beevor is not a bad starting place. The CTV seems to have been Mussolini's own idea, not something the Nationalists requested, and there was a certain amount of chuckling in Nationalist circles over the result. And as I recall the French position changed with election results. Leon Blum and his crowd were very sympathetic to the Spanish left. But late 3rd Republic governments didn't last long. I remember reading that Nationalist officers toasted their opposite numbers in the Republican Army when the latter defeated the CTV at the Battke of Guadalajara. I was told a couple of weeks ago that a few lived out their lives in Mexico, where they assumed new identities. I wonder how true that is. I doubt all were captured or killed. As a side bar. Many of the survivors of the WWII Spanish Blue Div., etc. were returned to Spain in @ '59.